A lovely rich nut brown liquid flows from the bottle, hitting the glass and swelling up with a head the colour of a stirred cappuccino. I think I smell a faint seaweed odour, but possibly because the label is telling me to. There’s a faint whiff of something though, maybe oysters? The Bladder Rack seaweed used in this supposedly age old Scottish coastal recipe is thrown in to the mash tun with the malted barley, so has plenty of time to cook out. As a result any sharp, pungent tastes you might expect have dissipated, but what’s left is a traditional rich brown ale with an unusual freshness on the finish. I only have one bottle, it’s a long drive to Alloa for more, I can survive without it but will certainly partake again when I see it! It worked out quite well with this one. It is a good refreshing warm weather beer. Well it just so happen we had unusall warm temps in the 60 (F) in December so I took advantage of it by enjoying this beer. Aroma of mild lactic acid, a bit of peach and some wheat. So they nailed the peach flavor. Though I’m sure they still use concentrate, the peach flavor is juicy and works well with the subdued tartness. Kind of like a peach Bellini beer. Super drinkable and quite sweet. The taste was sweetly tart right off and was present throughout, with a decent peach flavor creeping in creating a tart peach taste for the finish. This is probably not the best example of a Berliner Weiss, but it’s an overall enjoyable experience. This is one of the few peach beers I have had that were not cloyingly sweet, the balance between tart and sweet flavors is just right. I would also claim that this is a great beer for introducing people to the style, and perhaps one that can satisfy a staunch wine drinker. Now I can’t wait for more warmer days.. 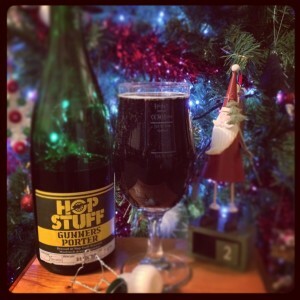 I approached day 2 of the 12 Beers of Xmas with some trepidation and excitement. Always a bit of a sucker for good packaging and branding this collaboration between Brewdog, Mikkeller and Nogne this was ticking all the right boxes. Weighing in at 15.2% it became my highest ABV beer drunk eclipsing Magic Rock’s Un-Human Cannonball (12%) that I had in the summer. On opening I wasn’t getting any great flavours hitting my nose (was I coming down with a cold?) which was surprising. The pour was relatively uneventful (with no volcano type spillage as per day 1) with no head appearing at all in the glass. First sips, and they were sips, I got big toffee and malty flavours. I was also getting a big hit of run (surprising as looking back at the tasting notes afterwards there’s no mention of rum). Obviously I wasn’t going to bomb this one so after about 45 minutes I could definitely taste an increasing smokeyness, not unpleasant at all. As I finally finished the drink after about an hour (perhaps the slowest I’ve ever drunk a beer) I was beginning to feel light headed and the fact I’d drunk a strong beer. I had a very boozy after taste in the back of my throat, which was quite pleasant and warming. Next thing I know, Mrs K had gone to bed and I’m waking myself up with the sound of my own snoring. Glad I had this on a Saturday, not a Sunday as I may have had a bit of a thick head next morning. Day 2 beer: Howay in a manger by Mordue brewery. To put this into context I’m a massive fan of Mordue brewery. They have Workie ticket which has been my favourite beer for years but also they have the panda frog brewery which is their experimental arm. The beers they produce are amazing. I’ve never really been a fan of seasonal special beers but wanted to give this a go given it’s heritage. Fist thing that hit me was the complete lack of a hiss when I opened the bottle. Bit of carbonation on pour but head soon disappeared. I expected some festive hints to the aroma but very little of note. This beer has the same dark look of workie ticket. It’s obviously shares the malt background but for me the additions needed to be more pronounced. It gets abit lost and falls short of what it could be. In short I wouldn’t go in for this again but would always choose it’s better known sibling Workie Ticket.